Day 4! The party season may be over but quite frankly… who cares?! Here’s a set of party essentials kindly donated by Girls With Attitude! 3 sets of false lashes for optimum glamour including: Madame Butterfly, Wild & Flirty and extra special diamante studded Burlesque Beauty Showtime lashes. Don’t forget to jazz up your nails too! There’s also 3 sets of nail art stickers for that extra bit of sparkle! Leave a comment to enter. Giveaway closes at 23:59GMT on 11th January. I waaant it! Enter me! Looks neat. Enter me please. Just starting to get into falsies… This would be awesome to win! Enter me please, I am a sucker for anything remotely sparkly. Do you know what, I don’t own any false eyelashes. Think I need to change that! I am a girl with attitude. 😉 enter me plase. Oh my goodness enter me please! So much fab. Every season should be the party season, so enter me please! Since i managed how to put them on, i can´t live without a good pair of falsies! enter me! I’ve never used false lashes before and I’ve love to try them! Plus the nail art looks wonderful! I would love to try the lashes! Please enter me! It’s like Christmas all over again Enter me please! ohh dang I love false lashes Thanks again for doing the giveaway! I haven’t tried using false eyelashes, but i would like too, if it’s a giveaway! 😀 and the nail stickers are way too cute! False lashes intrigue me, enter me please. Falsies + nail stickers = LOVE!!! <3 Those studded lashes are really interesting. I am loving those lashes, count me in, please! enter me please – maybe I will get better with lashes! OMG! I absolutely love false lashes and nail stickers! Oh, that’s lovely. Enter me!!!!!! the nail stickers are too cute! Those are beautiful! Enter me, please! oh lovely enter me please. they are gorgeous and fun! Doesn’t matter the season is over, I will find myself an occasion to wear these! Please please enter me! What amazing prizes! Thank you! 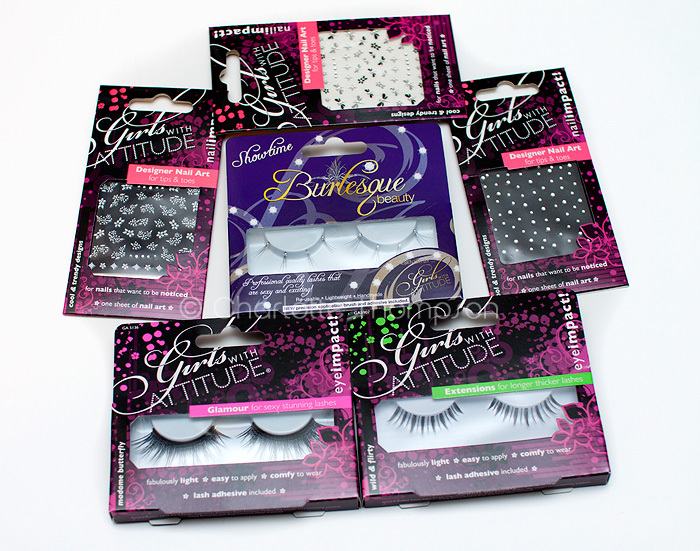 Oh my laaaawd, I must have the burlesque lashes! Cuuuuute! So out of my radar, but one can’t say never until one tries, right? Very cool! Enter me please! Please enter me! So sorry to hear about the site crashing and glad you are back up and running! Beautiful lashes. Enter me please. I would love to try those! enter me please!! Enter me please, the party season is never over. but if I win them I can experiment! I’d love to try out their eyelashes. Enter me please! These seem lovely! Please enter me. ooh, those are so pretty!! They’re gorgeous 😀 I particularly love those sparkly lashes! I love playing with false eyelashes! Ohh nice. So very glamorous. I can’t read the rules for some reason?! I love them all. Super ferocious, and sparkly. I have a thing for sparkly. These lashes look amazing, especially the glamour ones. Enter me please, love glam lashes! They’re gorgeous! Enter me please ! please just give them to me? Enter me please, need more practice with falsies! Very pretty Enter me please! Ooh pretties, please add me. uh that looks good =) I love nail art, and I don’t ahve false lashes… enter me please! Thanks again for the awesome giveaway. one can never have enough falsies so sign me up! !